Cybercriminals have become the catalysts for high-value fraudulent transactions, including those related to controlled pharmaceuticals. Unlike organizations within the relatively secure financial services industry, healthcare providers often lack mature fraud-monitoring capabilities, so attacks on them are more successful for cybercriminals. 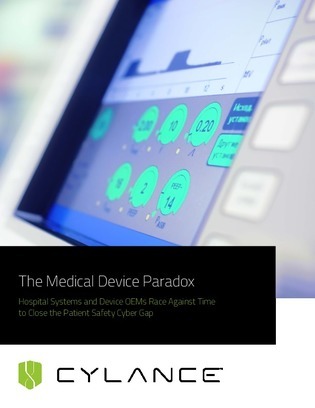 This white paper will help educate you about the growing paradox between medical device efficacy and the trends in medical device vulnerability and cybersecurity. You'll ultimately learn why your hospital system needs to consider an endpoint protection platform to proactively prevent the execution of advanced persistent threats and malware.